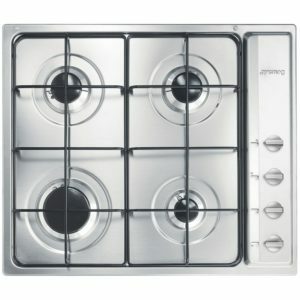 You will be able to cook up all your favourites with this great 4 burner gas hob from Smeg's Piano range of appliances. Finished in polished steel with Evershine; Smeg's clever finish which protects the surface with a brilliant shine, it will certainly make a great impact in your kitchen. 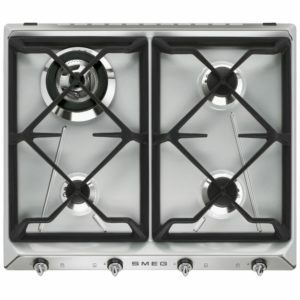 This superb 73cm wide gas hob from Smeg boasts five gas burners with cast iron pan supports. Finished in stainless steel it will look great in any kitchen. 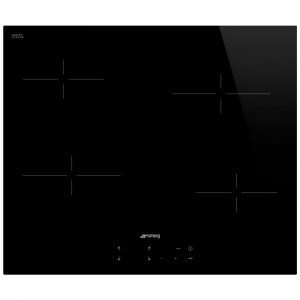 This superb 60cm wide ceramic hob from Smeg boasts four heat zones and touch controls. Finished in black glass it will look great in any kitchen. 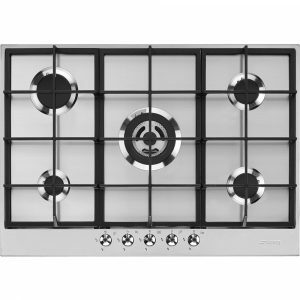 Sure to make an impression, this fantastic 72cm wide gas hob from Smeg boasts five gas burners including a powerful ultra rapid burner. Finished in Evershine polished steel it offers great shine and protection from tarnishing and is sure to look great in any kitchen. 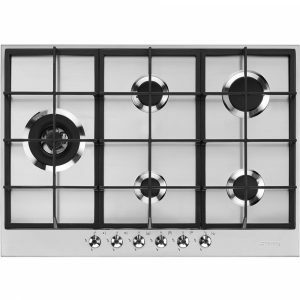 Finished in stainless steel, this fantastic 4 burner gas hob from Smeg has a distinctive look that makes a great feature in the kitchen. 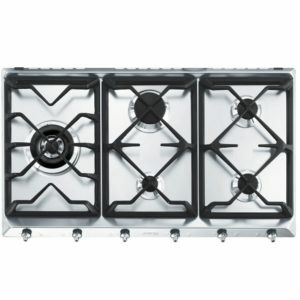 Offering 4 gas burners for great power and fine control, you will be able to cook up some fantastic meals with ease. Want to make an impact in your kitchen? 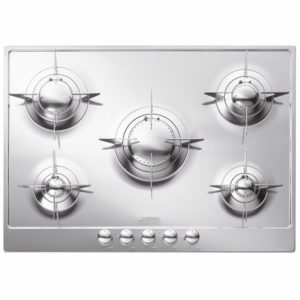 Then this superb 60cm wide Multizone induction hob from Smeg will be worth a look! 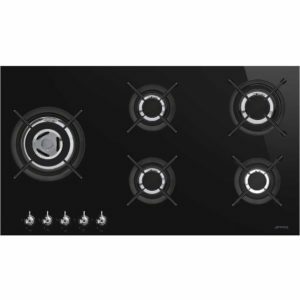 Boasting four heat zones with the option to combine zones for the ultimate in flexible cooking, automatic pan recognition, 14 power levels, boost and timer functions you can really cook up a treat! Finished in white glass and suitable for flush fitment it is incredibly eye-catching and modern. 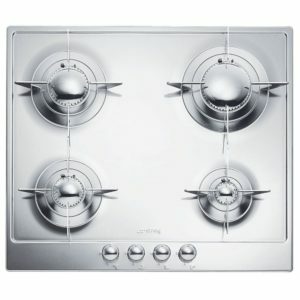 This superb 60cm wide gas hob from Smeg boasts four gas burners with enamelled pan supports. Finished in stainless steel it will look great in any kitchen. 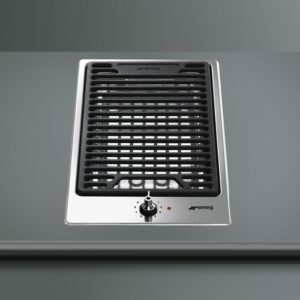 Style and functionality collide with the Smeg PGF30B modular barbecue hob. Barbecuing year round was never easier. 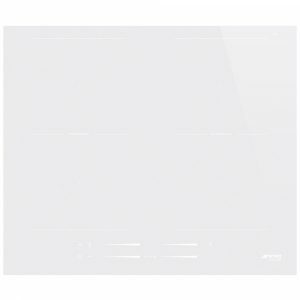 Arriving with an ultra low profile base, stainless steel controls and a cast iron grid, the PGF30B is the perfect addition to any kitchen. 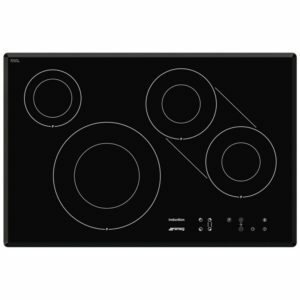 Smeg bring the ease and fun back to cooking with their 77cm wide induction hob. With four heat zones with independent boost and timer functions, nine power levels and residual heat indicators it really performs for you. With a black glass finish and bevelled edges it looks incredibly cool and sleek, great for a modern kitchen.